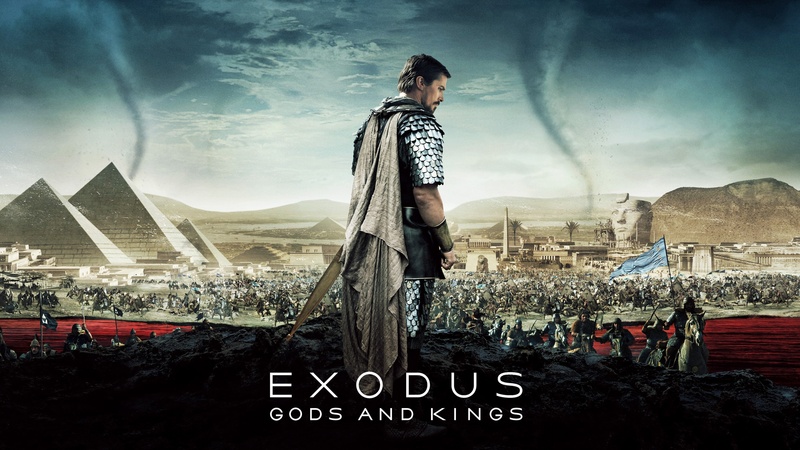 I was wary about going to see Exodus: Gods and Kings following initial reports of racist casting and frequent bad reviews but I also really wanted to see what director Ridley Scott was doing with stereoscopy in his second 3D feature. For all that his first 3D feature, Prometheus (2012) was met with mixed reviews, I thought it offered really exciting visual fields that made good use of varied depth planes. It was interesting to see how Scott transferred his use of stereoscopy from a science fiction setting in which great liberty could be taken with the visual scenarios to Exodus’s biblical setting which, although fantastical in many ways, had to stick more closely to real-world elaborations of depth. In many ways, Exodus adhered to the formula that is being used across various 3D action blockbusters: development of depth-rich vistas in positive parallax space during opening sequences; initial battle/action scenes where very little material protrudes into the auditorium; then a general ramping up of the depth budget so that the climatic action scenes make use of all available depth planes and unashamedly assault viewers with material coming towards them. Although formulaic, the depth fields that were constructed in this system were extensive and rich in detail, proving that Scott and his stereographic team have a good eye for how to use 3D technology in dynamic ways. From the beginning of the film there were nice subtle touches such as the way framing in stereoscopic depth works in the opening scene. As we see slaves constructing buildings in Memphis, our view is bordered by what seems to be a square framed doorway or other architectural opening that sits relatively close to us while the slaves are positioned deeper within the view. It forces us to peer in towards them, suggesting a specifically directed view into the past rather than immediate access to it. In subsequent scenes, where Rameses and his father discuss the impeding battle of Kadesh, interior architecture space with tall columns, archways, and carefully positioned furniture create a type of sculpted space where the relationships between the characters, each other and the space they operate is clear. Throughout the film there is good use of two major movement types that use stereoscopic depth in particular ways. In the first, objects frequently come down the z-axis (from deep within the screen space) towards the audience. For example, chariots galloping towards the cameras in battle scenes. Stereoscopic depth planes enhance the sense of impeding proximity and the feeling that these objects might just reach us. When these shots take place in expansive landscapes, they enhance a type of sublime spatial relation between us and the objects. 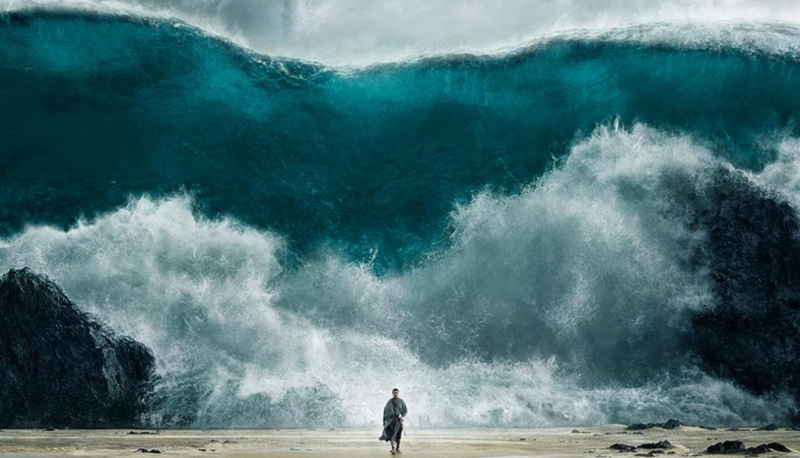 The most dramatic of these shots is towards the end when the Red Sea tsunami comes ever so close to engulfing us, the waves rearing up in threatening extended takes. In the second type of movement, cameras travel into the scene, enhancing our visual exploration of deep space. They most often produce a type of lingering gaze that allows us to feel as if we are slowly investigating the visual world presented to us and this is in contrast to the restless and frantic cameras that characterise a lot of other Hollywood 3D films. Like all good contemporary 3D films, underwater scenes are used to submerge the audience into thick, tactile visual fields. When the River Nile fills with blood, this space thickens further in gruesome ways. Not long after, the gruesome depictions are extended when stereoscopy enhances the details in the horrible textures of the Egyptians’ plague infected skin. But does any of this redeem the film’s unwise casting choices and Eurocentric retelling of what are considered to be historical events? I don’t think it does and I think that it furthermore points to an interesting scenario in which 3D visual systems can become about nostalgia as much as the technology of the future. Whereas Prometheus updated science fiction visual fields to show how our cinematic future might operate, Exodus harks back to a certain Technicolor golden age of twentieth century cinema. When Moses is exiled from his home with Rameses in Memphis, his true calling as a cinematic biblical figure begins. We see various shots of his stoic face, framed by head scarves and textured by his grizzly beard. Taken as stills, these images could easily be iconic shots from a 1950s studio catalogue for Old Testament themed films. When projected in stereoscopic depth, the extra detail livens and exaggerates this familiar picture. As his character develops, and as stereoscopy enhances his presence as well as the landscapes around him, Moses is the perfect figure to return us to the two dominating depictions of male heroes in the 1950s era: the biblical epic and the Western, in which the hero is a fearless pioneer. Working through a familiar character arc, Moses has his moments of doubt but his steely determination always returns. Even when surrounded by others, he is a lone figure that must press on ahead. But it is also a film about landscapes, and man’s small role amongst the sublime. Stereoscopic depth planes take the familiar surfaces of the biblical epic and the Western and revitalise them so we can see them, and our supposed role in them, anew. With the all-white cast, this film becomes the perfect Americana fantasy of what Egypt was, rooted in our twentieth century culture rather than any greater historical outlook.